A native of Dayton, OH, tenor Christopher Puckett has maintained an active career as both a performer and teacher over the last decade. He made his professional operatic debut in 2008 as a member of the prestigious Gerdine Young Artist’s Program at the Opera Theatre of Saint Louis, appearing as Wolfram in The Tales of Hoffmann. Other operatic credits include leading roles in The Turn of the Screw, Così fan tutte, Street Scene, Cendrillon, A Midsummer Night’s Dream, La Sonnambula, Don Giovanni, Little Women, The Mikado, Le Nozze di Figaro, and Susannah. Equally at home in concert repertoire as on the operatic stage, Dr. Puckett has also performed roles in a variety of oratorios, including Haydn’s Lord Nelson Mass, Mozart’s Requiem, Handel’s Messiah, Mendelssohn’s Elijah, Dubois’ Seven Last Words of Christ, and Haydn’s Missa in tempore belli. Dr. Puckett has a particular interest in the works of Johann Sebastian Bach and has frequently appeared as a soloist in performances of Bach’s church cantatas. In 2016 he made his debut as the Evangelist in Bach’s St. Matthew Passion as a part of the Southwest Area Choral Director’s Association Regional Conference in Kansas City, MO. 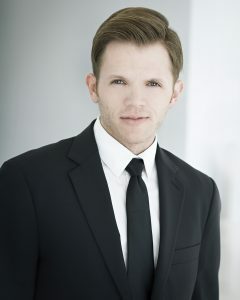 A champion of new music, Puckett recently sang the role of Sergeant Edward Younger in the world premiere of Timothy C. Takach’s oratorio We, the Unknown with the Heartland Men’s Chorus of Kansas City, and also sang the Alabama premiere of Evan Mack’s A Little More Perfect. In addition to Bach, Dr. Puckett is an ardent interpreter of the music of Benjamin Britten, and also holds a particular interest in both the study and performance of music of modern LGBTQ composers. Dr. Puckett holds degrees from the University of Missouri-Kansas City Conservatory of Music and Dance, the University of Northern Colorado, and Wright State University. He currently serves as Assistant Professor of Music and the Head of Vocal Studies at Westminster College in Salt Lake City, UT.